Network traffic monitor that keeps an eye on your bandwidth usage. Is there a better alternative to mTrafficStats? Is mTrafficStats really the best app in Network category? Will mTrafficStats work good on macOS 10.13.4? 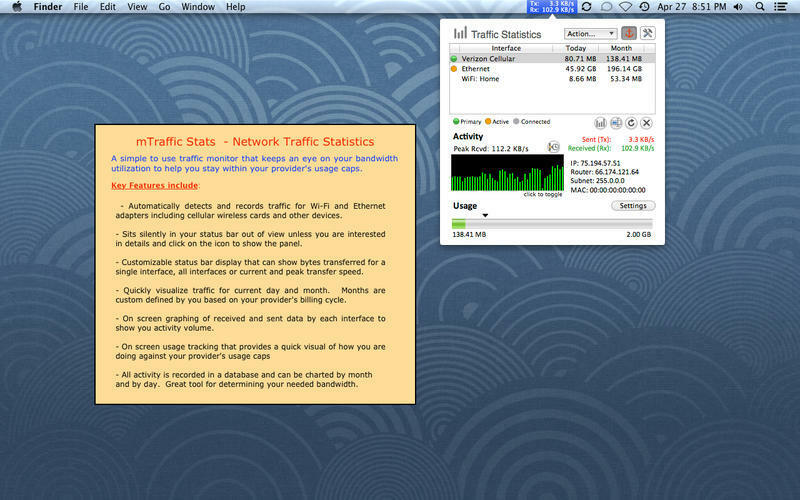 mTrafficStats is a simple-to-use network-traffic monitor that keeps an eye on your bandwidth usage to help you stay within your provider’s usage caps. Automatically logs all network activity across Wi-Fi and Ethernet interfaces. Program runs silently in the background until you decide that you’d like to see how much bandwidth you are consuming. A simple click on the Mac menubar brings up the detail panel. Logs bandwidth usage by day and saves the data so that you can view your usage over time. Monthly and daily charts represent this data graphically. mTrafficStats needs a review. Be the first to review this app and get the discussion started! mTrafficStats needs a rating. Be the first to rate this app and get the discussion started! Works well for mobile users that frequently use a mobile broadband card or other adapter that has provider specified limits. Enter the day you billing cycle starts and the your monthly quota allotment and mTrafficStats will keep track of your monthly usage and give you a quick graphic that represents how you are doing. Easily see if you are on track or running over at any given point in the month.